I will never get used to the Dallas cold. Being in South Texas most of my life... Makes you miss the constant heat. Oh--well that's not good, not in the slightest. The sun makes the body do crazy things. Texans don't do well with cold lol. I'm looking forward to the heat when I move there in a few months. Terrible. Never know how much time you have... But it's never enough. Updating my website a little bit. It's coming along, all I can do now is keep adding things as they come. Today, one hundred years ago--World War I ended. Crazy. Happy Veteran's Day. Matseb2611, Vance Raehart, l8rose and 1 other person like this. I'm not sure, too much world tension. Tensions, but overall, a lot less wars. Found Ecto Cooler vape liquid. Life is grand. Pushing my girl to exercise with me--she's angry, but she'll thank me in a few months. Well, I always exercise but--ohhh... wait... now I get it! Ya just need to find something you enjoy. I've been boxing and doing mixed martial arts since I was a teenager; I fell in love with it. I still have my golden glove award when I was given the title :'( makes me sad to look at it, but gives me fond memories of beating the snot out of everyone else. Philosophus Vagus, Matseb2611 and Faye Valentine like this. Woken up to the sounds of someone arguing. Old boy sounded really angry. My neighbor never gets angry--I should be nosy. Ability "Master Gossip" unlocked! You can now invoke any reason to justify being nosy! 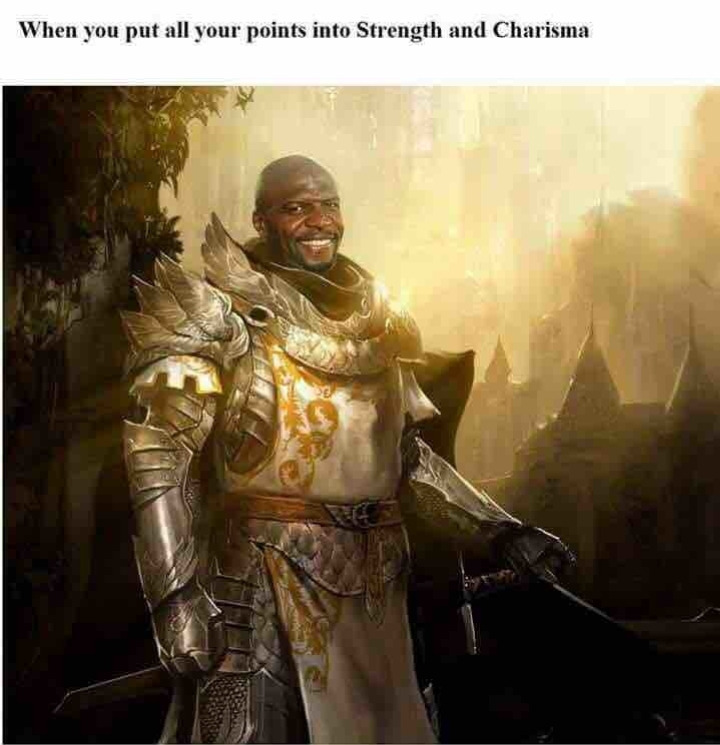 Helps to have 18 charisma. So--someone keeps trying to hack my twitter... I don't have a twitter. Okay--that's incorrect. I do have one... but I never used it, except maybe once back in 2008? If they want to hack it, that's fine I guess? Okay nevermind... I took it back. Decided they can't have my stuff. True that. But I'll tell ya... I didn't get to make my bed this afternoon... So the point is now moot. Ugh man... I've been trying to bulk up but I keep losing. And I was chasing bunnies and fell and injured myself. Maybe I should just make the bed after all and cry in it. Woke up--with a very stiff back and the smell of onions permeating the air... only there's no onions anywhere. Well last night I did kinda fall into a bunny hole while running. As for the onions no idea. Found what was causing the onion smell--apparently... I missed a trash bag in the garage and it was next to the intake... gross. It's the Drake Equation vs. The Fermi Paradox. Probability vs evidence. The solution is in the word. UFO - Unidentified Flying Object. We may never find aliens--but we'll never know. Faye Valentine, OnslaughtSupply and SpaceBot like this. Better that way than to drink the juice and then brush away your enamel at least. Small positives. samkfj and SpaceBot like this. Anything that is not an elephant--is irrelephant. TWings, megumi014, SpaceBot and 1 other person like this. I cannot sleep on lunch breaks. I need at least two hours of sleep in my current state before I can wake up. If someone tries to wake me up before that, even if it looks I'm awake, I am not. I really hope I can get into day shifts or get used to it, because I'd be forced to quit otherwise. Yeah, do what you have to. It's tough, I can't lie about that. Use dark glasses for sleep or one of them soft eye mask things, turn off or mute your phone, tell everyone that might call you to just not do it, make your room cold as possible, don't drink caffeine too late, make your room dark. If you can get on days it would be a lot better, keep trying for that too. Or I can just try to find a way so that nobody can look me in the eyes Sunglasses are out of the question though for obvious reasons. Remember to turn your clocks back--those affected by DST. Or well... they kinda do it automatically now these days. Know what--nvm. I wish people would take it out of context and I could see mass amounts of people falling backwards for no reason. Maybe it's that am tired--but that just totally blew my mind. I cannot breathe at the moment from laughter. Well played. KanaX and SpaceBot like this. Had a nightmare I was in Fallout 76... and it turned out to be good. Any reason why you stopped? To be honest... I stopped too. I didn't like the story... I have no idea how it ends, and really--I don't care either, sadly. I do have to say--Wasteland 2 was really good. A little campy and tried a bit too hard with it's humor, but a great adventure. Got home, girl told me she ran out of candy... started giving away green tea instead. First day back at work... And someone trashed my office and ate my cheezits. There will be blood. Marsigne, Frogboy and OnslaughtSupply like this. Good luck! May you win 2 million dollars. Haha if only, but at least I wasn't down by the time we left! Always next time.